"I hate CW!" I heard a voice at a hamfest flea market recently. As I strolled up to his table, he followed up with, "You gotta help me by buying these keys." I didn't feel like debating the finer points of operating CW with him. I was more interested in what was on the table: three sets of keyer paddles. The first was a a Heathkit HD-1410, which I knew to have a reputation for horrible feel. One other was a single-lever paddle, which I had no interest in. The third looked to be a Bencher BY-1. I generally go to a flea market with a list of all the different things I'm looking for. I didn't this time, but I did remember I was looking for an inexpensive set of keyer paddles. The Bencher looked like it might fit the bill. Back in 1979, when I was licensed as N8BHE, I found the progression of dits in my call difficult to send, so I opted to upgrade from a straight key to an electronic keyer. I bought a Ham-Key iambic paddle and built my own CMOS keyer. Now, the Ham-Key isn't the greatest paddle design. The base isn't quite heavy enough, the paddle arms pivot on large pins, which leaves some slop in the feel. But in 1979, it was only $30, and I've been using that same unit for 31 years. I figure it is about time to get a second set of paddles. If you look around, you'll find they are not cheap. There are none you can buy for less than $50, and most of them are well over $100. The item on my list read "cheap paddles." That meant finding something used, hopefully in reasonable shape. I had used a Bencher before, back in 1980 in the Georgia Tech club station W4AQL. I remember my first experience touching those paddles. I slapped the handles so hard the armature came off the pivot. I suppose you have to use a more delicate touch than with the Ham-Key.... But I did have some success using it. This fellow had this unit marked $20. I offered him $10, then $12, and finally we agreed on $15. As I walked away from the table with my purchase, another fellow suggested I tear the unit down completely and clean it, and it should work great. That's just what I had in mind. Once I got home, I put the Bencher on the workbench. It was far grimier than I remembered, with a telltale film of yellow tobacco on the base and armature. During disassembly, I found the hold screws to be hopelessly bent, and one of the screws holding the round armature pedestal nearly impossible to remove. With vice grips I removed it, but this destroyed the head of the screw. All of the metal hardware went into a small container filled with WD-40, which did a good job of removing the latent grime. I cleaned the base and plastic parts with Windex. This took off the grime, but some of the paint came off as well -- likely due to a long-standing chemical reaction of the dirt with the paint. No matter, a couple of coats of flat-black spray paint and the base looks good as new. Then the tedious process of putting the components back together. I replaced the four screws that I could not reuse, and quickly re-assembled the unit and adjusted it to suit my fist. I followed the excellent instructions compiled by N1FN here. The result you see pictured above. It looks great and the feel is good, too. I'm not as ham-fisted as I was back in 1980, so I haven't had any trouble springing the mechanism. The base is way heavier than the Ham-Key, so it doesn't tend to wander as much. I believe I'm really going to enjoy working CW with my Bencher paddles. I've had a great time this past month chasing the four new entities from the dissolution of the Netherlands Antilles. Even with a modest station with a small amplifier, I've been quite successful in getting through the pileups. Sure, some hams don't even have a tribander or amplifier at their disposal -- but there's no reason they can't work DX. It may just take a little more effort. The key to busting pileups is to listen. That's what the DX experts will tell you -- and they are right. The first thing about busting pileups is not to transmit. You can't listen when you are transmitting. But just telling someone to listen doesn't help if they don't know what to listen for. There are several things you need to listen and find before you begin to transmit. First, you have got to hear the DX station. If you can't hear the DX, and hear him well enough to tell exactly what he is doing, there is no use transmitting at all. This can be very frustrating when you hear him work your buddies all around, but its the truth. If you can't hear 'em, don't even try to work 'em. Next, once you can hear the DX well enough, you've got to know where he's listening. This is easy if he's working stations simplex. But, more than likely, for any reasonably sized pile-up, he'll be operating split. And that makes things more challenging. If you have a fancy radio that allows you to listen to two frequencies at the same time, this the next step will be easier. Basically, what you have to do is listen to the DX station on his frequency, and then find the station he's working on his receive frequency. You don't have to have the fancy radio -- you just need two VFOs and some nimble fingers. On the Elecraft K2 I use, you can hold down the A/B button, which activates the REV or reverse feature. This causes the radio to swap the VFOs it is using for receive. So, one moment you are listening to the DX station come back to someone, then you press REV to switch to the other VFO, and then hold it down while you tune around for the station being worked. But, don't hold it too long, or you'll miss the DX station's next transmission. Sounds complicated, eh? Well, maybe. Figure also there's no guarantee you can actually hear the station the DX is coming back to. You might have to do this over and over again until you hear one. Then you have to worry that the DX station is staying in one spot -- he might be tuning around in the pileup. But the best place to be when you start transmitting is right around the place the DX station was listening last. Once you've done this, it is probably time to start calling. If you need to tune your amp, please move a few kHz off the DX frequency before you start. Your calls should be short -- just your full callsign, and then go back to listening. Perhaps you do this cycle two or three times, depending on the pileup. Once the DX station comes back to someone, there's no sense in continuing to transmit -- unless that stations is you. Even though you start transmitting, you don't stop listening. Who is the DX station working? Is he working stations in your area, or are they all on another continent? Perhaps he's working folks from all over. Listen closely to figure this out. Who are the stations he responds to? Are they the earliest, strongest callers, or is he picking later in the pileup when the calls die down? Is he accepting or ignoring tail-enders? Figure out the pattern that the DX station is using, and use that information to place your calls better and better. OK, you've done all that? Now is the time to have patience. Pileups can be huge random events, and if you keep on listening and carefully transmitting, you'll eventually get through. It may be on the first or second call, or it may take a half and hour of calling with no joy. Don't get discouraged. Even so, there are a few that get away. Propagation will change, or the station will QSY or QRT. You can't help that, so don't worry about it. Most of all, don't let your worry interfere with your operating. Careful listening can make all the difference. I've broken several pileups on the first or second call after listening to them to for several minutes. Good listening should tell you where to transmit, and precisely when. Don't allow yourself to get frustrated and learn to enjoy the hunt. When I was first putting down radials, I bent a few "clips" by hand. Once I figured out that I had to have one clip every 3-5 feet of radial, I needed a better solution. Basically, a clip consists of about 4" of 12-14 gauge copper wire, bent double, with a large enough bend radius to allow a 12-14 gauge copper wire to fit between it. The resulting clip is about 2" tall, which is about right. Any taller, and you may have difficulty pushing it into the soil without bending it. What I needed was a jig that would make it easier to cut the wire to the right length, and then bend the clip perfectly each time, perhaps creating more than one at a time. Grabbing a scrap piece of wood and a few nails, I quickly fashioned the jig you see photographed. 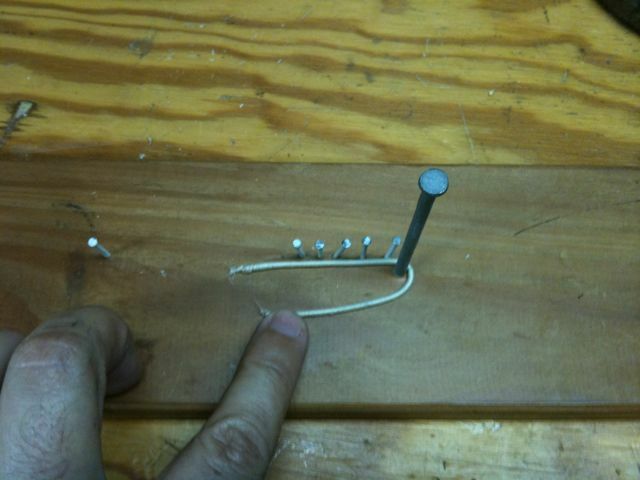 The jig consists of a large 16-penny nail and a row of small wire brads. 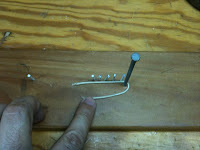 A extra wire brad is placed about 4" away from the 16-penny nail, and serves as a measuring point. First step is to slide the wire up to the 16-penny nail, and cut it just behind the furthest brad. 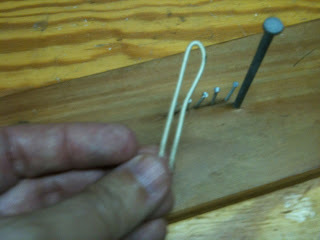 One can do this several times in succession to create a bunch of wires the correct length to be bent into clips. Next the wire is inserted between the brads and wrapped around the 16-penny nail. Several wires can be stacked at once and bent at the same time. I have the best success with about three at a time. There you have it. With the jig it is no problem cranking out 50 to 100 clips with just a few minutes of work. The key to effective ground-mounted vertical antenna is radials. While conventional AM broadcast practice is to use 120 1/2 wave radials, you don't need nearly that many to have an effective antenna. My shunt-fed 15m tall tower works just fine with 30 radials. None of these radials approaches 1/2 wave on 160m. Most are slightly less than 1/4 wave on 80m. Even if they aren't very long, and don't come close to a hundred, it's a lot of wire to lay down. My vertical has about 2,000 feet of wire down today, and I'm looking to add about 1,000 more before the fall. It helps to have a system for laying them down. The technique is very simple. The wire is laid on the ground, and the grass grows over it. After a few months, you will be hard-pressed to find the wire, or pull it up, even if you wanted to. Start off by mowing the grass. You want this cut to be as short as you can make it without hurting the grass. Shorter grass will also make it a little easier to lay the wire. Copper wire is expensive today, but is most compatible with the soil in most areas of the country. You don't need a heavy gauge. I started with some scrap 12 gauge cotton-covered wire I had. Insulation doesn't matter, and the wire should last longer if insulated. I would recommend 12 or 14 gauge THHN insulated solid house wiring, since it can be bought inexpensively at most home improvement stores. I would not suggest using anything smaller than 16 gauge, as the wire has got to take some abuse being on the ground. Hunt around at hamfests and offer to buy any spool of several hundred feet of wire for a buck or two. At the base of the antenna, there must be some way to connect the radials. A few companies make expensive jigs for this purpose. I used a piece of 4 gauge copper wire, clamped to the tower legs. I put strips of stainless steel between the wire and the tower legs, to avoid dissimilar metals corrosion of the zinc plating. 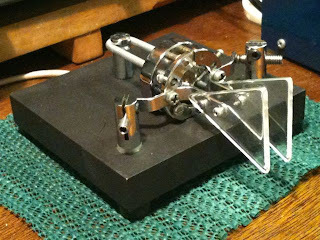 I then solder the radials to the wire ring using a 240 watt soldering gun. A little work with fine sandpaper makes this job go faster, as the copper wire has a thick layer of oxidation from being outside. Once you've connected the radial to the base of the vertical, simply lay it out along the ground. As the ground is never perfectly flat, don't try to stretch the wire. Remember, we want to be able to mow over the wire. Stretching it will make it pop up in the low places along the ground. To keep the wire close to the ground, so the grass will grow over it, I use a series of short clips. These are 3-3 1/2" pieces of 14-12 gauge wire bent into a U. You just fit them over the wire and press into the ground. You don't want to make them much more than 3 1/2", because they will bend when you try to push them in. You can generally do this by hand, but after putting in a few dozen clips, it will tend to hurt your thumb. I try to grab the clips with a pair of lineman's pliers and push them into the ground. I generally walk along the wire heading away from the antenna, pushing the radial down with my foot and then adding a clip. If the soil is really dry, you may have trouble inserting the clips. In that case, you can wait for a good rain, or gently water the path of the radial. You'll need about one clip every 3-6 feet, so that's a few hundred clips if you are laying down 1,000 feet of wire. I built a little jig to make the bending process easier and more consistent. For the next several days, it is good to inspect the radials to make sure kids or critters haven't pulled a wire up. I suggest not mowing for a few weeks. When you do, use the highest setting of the mower until the wire is clearly captured by the grass. Radials definitely improve the performance of a vertical. Put down as much wire as you can, and you'll be pleased with the results. I've been working on my little homebrew 40m receiver. When I added an internal speaker, I found that I was getting an oscillation in the audio amplifier when turning it up loud enough to hear. A bit of sleuthing with an oscilloscope led to an unusual conclusion. My first problem was an oscillation on the voltage regulator. I used an LM7805 regulator, but raised the ground pin up with four 1N4001 diodes to give about 7.5 volts. On the voltage input pin, I could see a .5 volt peak-to-peak oscillation at about 2 MHz. There was a smaller variation on the output pin. I pulled a couple of .1 uF multi-layer ceramic caps out of the junk box and proceeded to put them across the input and output to ground. No more oscillation in the audio amplifier. While I had the rig on the bench, I was also trying to diagnose some harshness in the presence of strong signals. What I found was that the AGC circuit was allowing some of the received audio to make it into the AGC input of the MC1350. Another .1 uF cap on the AGC input of the MC1350 helped to smooth that out. Another issue I tackled was the BFO frequency trim only allowed a center frequency of about 850 Hz. I added a 10 pF capacitor across the adjustment trimmer and could tune down to about 700 Hz, which is much more listenable. Only issue I haven't figured out is a third-harmonic response around 2100 Hz in the receiver passband. Probably need another capacitor somewhere else. In any case, about an hour of work and the receiver works well with the internal speaker, and is much more listenable on the phones. 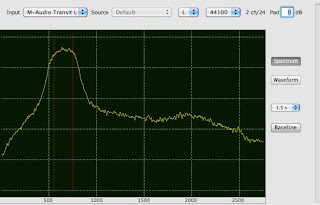 When calibrating the Elecraft K2 crystal filters, a noise generator becomes an invaluable tool. Using one results in clean spectrum traces. I had built an RX noise bridge some time ago from an ARRL Handbook -- the original article for that project appeared in the December 1987 issue of QST. The noise source is a reversed-biased zener diode -- which produces noise of fairly broad bandwidth. A two transistor amplifier chain feeds the trifilar winding of the noise bridge transformer. This circuit had the unusual addition of an oscillator to switch the noise off and on at about 1 kHz. This made for the very disconcerting effect of hearing 1 kHz tone no matter where the receiver was tuned. The noise bridge was intended to help me tune a manual antenna tuner without having to transmit, but it didn't work as expected. However, the two transistor amplifier didn't seem to provide much output -- I got the strongest noise signal when attaching to the base of the first transistor. Perhaps this is why the tuner-tuner project didn't work so well. I suspect there's something wrong with one of the junkbox transistors I used. My main problem was that I needed to jury-rig it with jumpers every time I wanted to use it. What I wanted was a dedicated noise generator -- which isn't much more than a zener diode noise source, followed by a broadband amplifier. Since I didn't have much luck with the two-transistor amplifier, I thought of using something different. Mark, WA3YNO suggested using an LM703 as the amplifier. I had a better idea -- why not use a MMIC amplifier? The MMIC offers high gain, unconditional stability and an impedance near 50 ohms. I'm surprised we don't see more MMICs in amateur designs. I had a few MSA 0885's in my junkbox. Perfect. Better engineers than I have already figured this out. If you look at the Elecraft N-gen, this is exactly what they did. So I build basically the same circuit on a piece of perfboard. The result -- S9+20 dB worth of noise. This circuit is so simple it's hard for it not to work right away. A switch is handy because the circuit draws over 12 mA from a 9 volt battery, so it won't last terribly long if you leave it on. Who Says Ham Radio Is Dying? OK, I've been watching this for a while now, probably since I stumbled on the site in about 2004. Set up by Joe, AH0A, it tracks statistics on the FCC amateur license database. It has been very interesting to watch. If you look at the table of total licenses, there are some predictable things happening: Advanced and Novice licenses have been dropping off steadily since they stopped issuing them back in April of 2000. In fact, there are so few of these, I wonder why the FCC doesn't just grandfather them into Extra and Technician class, respectively. However, the number of Extra, General and Technician class licensees have been going up for some time. After the FCC stopped testing for CW proficiency, the number of Extra class licenses has skyrocketed. Technician and General class licenses have been on the rise, too, if you overlook all the licenses being upgraded to General and Extra. But the exciting news is that Extra, General and Technician class licenses are at record levels, and the total number of licenses has surpassed it's previous record. While certainly not all the licensees are active, it is good to see the increasing numbers. A healthy number or licenses should keep amateur radio alive for a long time. The Elecraft K2 has a number of unique features, one is the variable bandpass filter which can be programmed for different bandwidths. This leads to a very flexible design for CW or RTTY, but requires a bit of configuration work. For each mode, you can select up to four crystal filter configurations (FL1-FL4), including using the KSB2 module filter (OP1). The first filter configuration (FL1) is also used when transmitting. Typical configurations use OP1 in the FL1 position. For CW, I opted to use 1000 Hz in FL1, then with the progression of 400 Hz, 160 Hz and OP1 for FL4. The 1000 Hz setting is about the widest setting that still has smooth sides from a single peak. Much wider, and one side starts to get a pronounced "hump". This filter is good for general tuning on an active band. 400 Hz is great for crowded contest conditions. I rarely use 160 Hz, but it is useful for digging out weak ones. I centered these on 600 Hz. The OP1 filter is good for tuning a quiet band, but it is harder to zero-beat stations. SSB and RTTY require OP1 in the FL1 position. On SSB, I used 1.8 and 1.6 kHz settings for FL2 and 3, but I rarely use them, the asymmetric filter makes for harsh listening. RTTY necessitated a minor modification. During the A to B modifications, I added 47 and 100 pF caps across C174 and C173, respectively for the BFO stability mod. I changed these to 56 and 120 pF. However, this did not shift the BFO frequencies at all. I added 3 pF from the X3/X4 junction to ground and this lowered the lower BFO frequency 800 Hz without affecting the upper frequency. The wider BFO frequency range is necessary to accommodate the higher tones use on RTTY. I originally picked the "low tone" frequencies of 1275 / 1445 Hz for RTTY. However, the resulting center frequency of 1360 Hz, can't be used with the KDSP2 filters. The KDSP2 filters can only be set to multiples of 100 Hz. So, I switched to frequencies of 1415 / 1585 Hz, nicely centered around 1500 Hz. For the rest of the RTTY filters, I used 1000 Hz, 500 Hz and 300 Hz. 1000 Hz is good for general listening, 500 Hz is pretty much single-signal, and 300 Hz clips the edges of the signal passband, but is useful for trying to dig out stations with surrounding QRM. Align the filters using the standard procedures for the CW and SSB filters, the RTTY filters are pretty much the same as the CW filters, except the center frequency is different. Instead of Spectrogram, I use CocoaModem on the Mac. If you go to the Config window, CocoaModem has a nice spectrum display. You can set the RTTY frequencies as markers in the window. You can see the picture at the top of the article shows CocoaModem displaying the 400 Hz filter spectrum, with markers at 550 and 650 Hz. When setting up the filters, it's helpful to try to flip between opposite sidebands (using the CW RV button), and check that both sidebands sound about the same. Bumping the BFO setting by one tick can often be helpful in getting them to match. Similarly, walk through the filter settings (using the XFIL button) to monitor any shift in the received signal. Moving the BFO setting one tick can help in some cases, but because of the DAC resolution it won't be completely perfect. With a little patience, it isn't hard to get the filters as close as possible. The filters in the K2 offer excellent performance in an inexpensive radio, it just takes a bit of care to configure them. Although I've had good success using an untuned doublet on the WARC bands, I made up my mind that it would be nice to have an antenna that didn't require a tuner. Initially, I built this antenna has a 30m / 17m dipole. 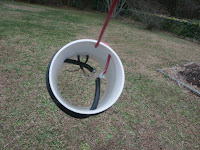 The traps are made from 1.5" Schedule 40 PVC pipe, which is about 1.9" in diameter, wound with RG-59U coax. 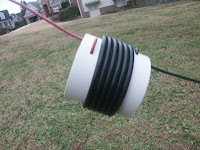 I built them in much the same manner as those I used later in the 80/40m dipole. The 17m traps are 35 1/2" of coax wound as 4.8 turns. I trimmed these traps to 18.1 MHz. I actually built three traps, the first was a dummy form so I could figure out where I had to drill the holes to pull the coax down tight. The 30/17m version uses 12 1/2 feet of wire in each leg, and the outer segments are 8 feet. You may have to trim the lengths to resonate the dipole in the band. Adding 12m requires two more traps. These were made from 26 1/2" of coax wound in about 3 and 3/4 turns. Trimming the 12m traps right on frequency takes some doing, as small changes in length can shift the frequency of the trap considerably. I inserted the 12m traps 9 feet 5 inches from the center, and then trimmed the length of the outer legs to bring resonance within the bands. I did not do a great job of measuring -- the 12m traps ended up in slightly different locations in each leg. It does not appear to affect the antenna much. You should measure the antenna at some height, as the tuning will change as the antenna is raised. I did my initial trimming at 15 feet, and when raised to 42 feet, the resonance frequency rose over 200 kHz on 30m, and slightly less on 17m. I built a current balun into the center mounting box for the dipole, using 10 type 43 1" ferrite beads, slipped over coax inside the box. Since the WARC bands as so small, antenna SWR bandwidth isn't a consideration. At 42 feet, there's a little bit of a broadside pattern on 30, more so on 17m and 12m. Since I installed this antenna as an inverted V, the pattern is a bit more circular. The traps can easily handle the 700 or so watts on 17 and 12m. The WARC bands are a lot of fun with a decent antenna. I've worked several DXpeditions with this dipole on 17m. Without sunspots, there hasn't been a whole lot of activity on 12m yet. 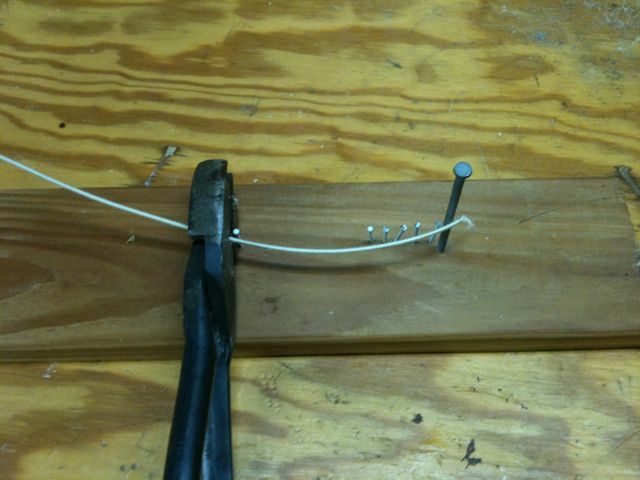 This sort of antenna is easy to build and install. There's no reason lack of antenna should keep you off the WARC bands. At my old QTH I used an 80m untuned doublet: 125 feet fed with open wire using a remote balun. 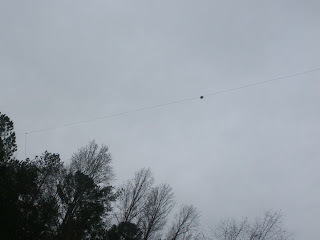 I put it up my at current QTH, shortening it to about 115 feet to fit my lot. It worked OK for a low dipole, but it was a bit troublesome. Even with a Murch UT-2000A tuner, I had trouble using it with my amplifier. It also took time to retune when switching bands. I decided what I needed was a trap dipole. I'd had some success building a trap dipole for the WARC bands using coaxial traps. After reading the analysis by W8JI, I still wanted to use coaxial traps, but I decided to use traps resonant off the operating frequency. You can see the result above, about half the antenna is visible, with the feedpoint on the left, and one of the traps just to the right of center. 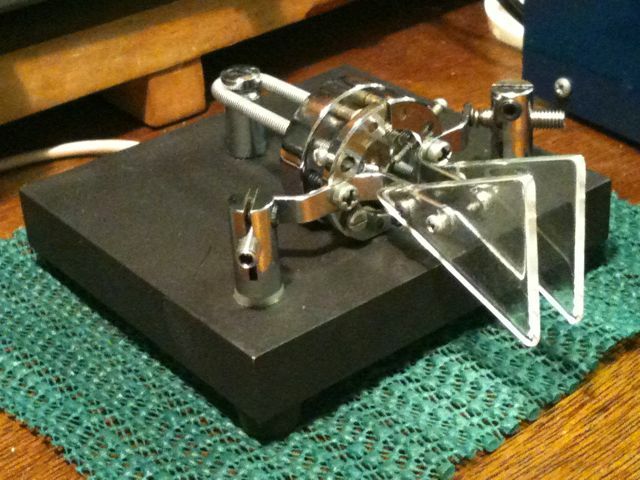 The traps are designed to be resonant about 6.6 MHz. They are made of 76 inches of RG-59A/U, wound in 6 and 1/3 turns around a four inch long piece of 3" schedule 20 PVC. The actual frequency of resonance isn't critical, so long as both traps are identical. The traps are wired in series, as shown below, the inner wire (black) attaches to the center conductor of the coax, and the outer wire (red) attaches to the shield of the opposite end. The shield of the inner end is connected to the center conductor of the outer end, as diagrammed by VE6YP. The center section is made of two 33 foot pieces of wire. In retrospect, another foot might have been better. The outer sections started at 26 feet each. 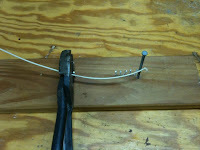 I cut off 10 feet 8 inches to bring the antenna into the band, resulting in 15 feet 4 inches. If you were to duplicate this antenna, I would start with 35 feet and 20 feet, respectively, and trim from there. Fed with RG-8x to a height of 35-42 feet, the antenna resonates at 7.22 MHz with a VSWR of 1.5:1, and 3.76 MHz with 1:1. With the typical automatic antenna tuner in modern rigs, or the pi network of older amplifiers, this antenna easily covers both 40 and 80m. Being so low, this antenna doesn't have much of a pattern on 80m, and only a gentle broadside pattern on 40m. I've been pretty happy with the dipole. It works well on 80m early in the evening when the propagation is short. Not bad for an antenna that's less than 100 feet long. I hope to add a couple more traps to add 30 and 20m this summer. I'll let you know how that works out.